Packing your Practice Beacon inside of a tougher container is a good idea because it protects it from the elements. It is obvious that electronics and water do not mix. Ammunition cans are waterproof. Additionally, they are virtually crush proof. Furthermore, they're not very expensive--you should be able to pick one up for $5 or so at your local Army-Navy surplus store. Your State Director may be able to find some for you, or you can ask someone who is involved with the handling of ammunition for the military--often times these boxes are thrown away or turned into DRMO. There are two basic sizes of ammo can that you will want to use, the 5.56mm or 50 Caliber can (medium size), and the 7.62mm can (narrow size). There are larger cans, but they would be too bulky. The can you want should obviously be able to contain your practice beacon. As an example, the can used for this page says "840 CRTG 5.56MM BALL M193 10 ROUND CLIPS." Translated, the box originally held 840 rounds of plain M-16 .223 caliber ammunition held together in 10-round zinc stripper clips. I wish I hadn't spent the 'worser' part of a summer at college loading those type of strippers into magazines. The 7.62 can fits the width of the Pointer Practice Beacon perfectly, eliminating some of the slop and banging around the beacon could take, but will not allow as much padding on the sides. If I were going to make another beacon box, I would use the 7.62mm variety as it is overall a better choice. The procedure suggested here is certainly not the only way this project can be accomplished. It only describes some of the pitfalls and suggests one possible method. A Radio Shack BNC connector is listed in the parts list above. This will work, but only with moderate results. After testing and use, a better solution is to have a panel mount BNC connector that has a female BNC connectors on BOTH ends. The problem is that the coaxial cable is very difficult to stabilize to the container, even with large amounts of solder and hot glue. Furthermore, a double-ended BNC connector allows a short length of coax to connect to the inside of the can, or to another antenna as described below. A part number is not available for this double-ended female BNC panel mount connector. first, drill a hole in the top of the ammo can. Your drill bit size should follow the specification on the package of the panel-mount BNC connector. I recommend drilling the hole on the hinged side of the can to allow the use of the shortest possible coaxial cable. If you place the hole on the latch-end, your coax cable must be able to extend enough to allow for a full swing of the can lid. Now that your hole has been drilled, you will need to rid yourself of the paint from around the underside of the hole. You'll want to strip about 1/8th of an inch from around the hold down to bare metal. It may not be a bad idea to do the same on the top of the hole. Stripping the paint will allow a good electrical connection between your box and your the BNC connector you are installing. A good electrical connection is necessary to allow the practice beacon to properly radiate. Paint is an electrical insulator. To clean off the paint, use a combination of scratching and sanding. A dremel rotary tool would be very useful to do this. The metal beneath should be clean and shiny. After the hole has been cleaned, you might note that there is a gap between two pieces of sheet metal in the lid. Crunch the bottom metal into the top using a vise, a large C-clamp, or even a bolt, some washers, and a nut. The bottom line is that you will have a better product if the metal is closer together. If you use the double-ended BNC connector, you simply need to mount it through the hole you constructed. Now all you need is a short length of coax with a BNC on both ends. This connector cable should be as short as possible to allow for maximum radiated power, but must be long enough for you to be able to get the box open and closed without damaging anything. If you don't have the expertise to construct your own cable, they can be purchased from any electronic supply house. Radio Shack even sells them. If you choose to use the Radio Shack connector, mount it to the box as specified on the package's directions. This will require the small wrench or at least a pair of pliers. It may be a good idea to use a little silicone sealant on it to keep it waterproof and to allow for a good electrical connection. If silicone is unavailable, petroleum jelly will also work. Once it is mounted, strip and solder the coaxial cable to the inside-end of the BNC connector. Again, follow the directions that came with the connector. Some builders recommend coax seal, a black sticky tar-like substance, to seal the underside of the BNC connector and the coaxial cable. If you cannot locate this material or do not wish to make that additional expenditure, not to worry. Hot glue is just as effective and perhaps much easier to use. Use a LOT of hot glue, slather it on. This will give you a more waterproof seal and a mechanically strong connection. A good epoxy glue is yet a third choice. Historically the joint between the coaxial cable and the BNC connector has been a very weak point on beacon boxes, so make sure it is strong. See the photo for an excellent example of someone who did a good job of this. If You will need to strip and solder the other end of the coaxial cable to a BNC connector that will connect to your beacon. Once you have completed this step, you are done with the difficult required portions of this project. Because you won't have to mess with anything to do with cables if you use the double-ended panel mount BNC, avoiding this pain is reason enough. Place the Practice Beacon inside the can, resting on the bottom. At left, note how this user constructed the beacon box in such a way that requires the coax cable to meet the beacon at a right angle. This is a result of the reinforcement of the coaxial cable on the lid of the box and the choice in mounting the beacon towards the top of the box. In this case, the problem was worked around using a T-connector (an elbow 90 degree connector would also work). Take this into account when considering where to place your hole and where you will mount the beacon within the box. Place adhesive-backed velcro to the bottom of the Practice Beacon and to its corresponding position inside of the ammo can. This will keep everything stable within the box so it won't shift during rough handling. You can also fill your excess space with foam rubber. This prevents the contents from crashing around inside of your container (contents may have shifted during flight). A s you see in the picture here, this ammo can has both a BNC connector for an antenna and a real aircraft ELT antenna. You can pick up one of these antennas for about $10-15 on ebay. Ask around your FBO or airport. You don't require a yellow tagged serviceable antenna--you just need an ELT antenna! The coax and BNC make it very easy to switch between the aircraft ELT antenna and and other antenna. The ELT antenna is very rugged and makes for realistic training. Its a great addition! If you choose to use a real ELT antenna, ensure you put something over the end to prevent eye injury. The ends of the real ELT antennas can easily whip around and tend to be sharper than your average antenna. You must always use some sort of antenna on your Practice Beacon. If you don't, you'll overmodulate the unit and prolonged operation will essentially burn out the transmitter. While the rest of the ammo can is going to be virtually indestructible, the antenna on the top will b e a weak spot. The collapsible antennas that are standard on the Pointer models will certainly work attached to the BNC connector on the box. Because the collapsible antenna is not the strongest, you may want to consider something more survivable. A "rubber ducky" type antenna placed on the BNC connector will allow quite a bit of added survivability. It should be noted, however, that you should use an aviation-band antenna (available from ham radio stores such as Ham Radio Outlet) versus the familiar 2 meter VHF radio antenna. A 2m antenna may cause excessive signal to wave ratio (SWR) and can, again, damage your transmitter over the long term. One reader of the website also pointed out that you can easily violate the type acceptance of the Practice Beacon if you increase the power output in any way--to include a gain antenna. We recommend that you use this project with an approved antenna so as not to violate these regulations. If your Practice Beacon has a radio station license and/or a log, you will have plenty of additional space to put it inside of your ammunition can. Some users choose to use a form of external battery. If you would like to do this, there will be plenty of room for this inside of your ammo can. If you'd like more information on how to modify your beacon to accept external power, see the Practice Beacon Modifications page on this site. OPTIONAL: While many searchers look for the Pointer's familiar orange or black box with a red light, you may want to change that appearance. I recommend painting the box with international orange paint. It is also wise to stencil the owner's information and a contact phone number on the exterior of the can. Orange will make the unit harder to hide, but I would counter with the fact that if you are close enough to see an orange box in the woods, then you are close enough to find a wrecked airplane. 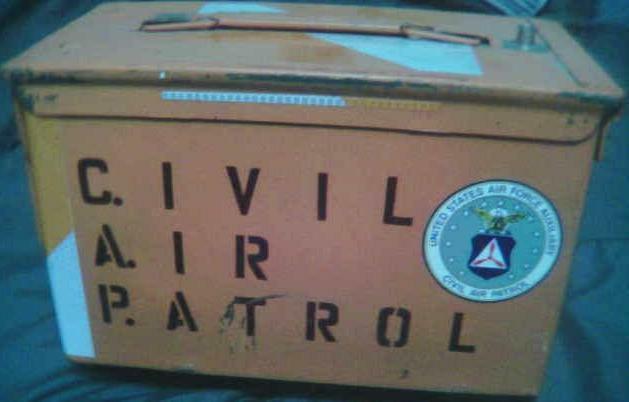 Furthermore, an orange ammo can resembles a cockpit voice recorder (CVR) or flight data recorder (FDR) that are carried abort transport category aircraft. Some people still call these "black boxes," when in fact they're most often international orange! OPTIONAL: If you live in a part of the country that gets cold, remember that your practice beacon's batteries won't work as well when they are chilled. Just as with real ELT batteries, however, they should work longer in this condition, but at a reduced power output. To help prevent this from happening, place a sealed chemical hand warmer inside the box near the battery pack. The foam rubber you already included is great insulation, but think about where the cold can conduct away your heat inside the metal box and insulate that, too. Many department and sporting goods stores now sell reusable hand warmers that you can use and recharge by boiling in water. If you are having trouble finding something like that, try in places that sell hunting supplies. There is a common misconception that cold temperatures decreases the life of ELT batteries. In actuality, cold weather will prolong the life of an ELT but at a reduced power. When very cold, the power output can be effectively nothing in a very short period of time! The batteries will come back to life once they warm up. The prolonged life is the reason why some people will store their ready-to-be-used batteries in the refrigerator. This is not a recommended practice because battery cells will give off gas that lightly can poison food. This is especially true of mercury batteries, but these are difficult to find on the commercial market. OPTIONAL: The weakest point on the box is now the BNC connector on top. When I was doing some work with copper pipe in the house, I cut off about a 3/4 inch of the 1 inch diameter copper pipe I was using. This would have otherwise been scrap, but I put it to good use. I hot glued that piece so it would fit all around the BNC connector. If there is no antenna on the box, the pipe piece will take the abuse that the BNC connector could not. Pipe is cheap, connectors are not, and they're much more difficult to attach! I simply hot glued the piece onto the box. I could have used pipe solder, but I had no more available. A special thanks to Heath Calhoun, Mike McDonald, and Bob Stimble for this thread on the CAP-ES talk listserver. They confirmed this design was workable and suggested a few details which I had not considered. Just for fun, here's a picture of my Practice Beacon Box after it has been well 'loved' on many a SAREX. I had some extra scotchbrite reflective tape and placed that on the box. My theory is that if you are close enough to see the orange box, or its reflective markings, then you are close enough to locate an aircraft accident. The "urban DF" skills exercise may require more "camouflage," but that wouldn't require a protective box, would it? On the backside of the box is a note to a 'random finder' not to move the equipment, and who to contact. Also notice that the box has been customized with some of our favorite words and graphics, as well as taken a bit of abuse. Well, that WAS the point, wasn't it--for the ammo can to take the abuse and the practice beacon to be pristine? I thought so. I have recently learned that some "evil" hiders are submerging practice beacons to add to the difficulty of the hunt. This may generally seem to be excessive, but an ELT can radiate after a ditching. More importantly, it can be found! The ammo can is one method of accomplishing this, provided that it is sufficiently weighed down. See the Underwater ELTs page for more information. An important note: a definite effort was made to call the Pointer 6000 a "Practice Beacon" versus a "Practice ELT" or an "ELT." Although sometimes difficult, it is a good idea to refer to training ELTs in this manner. If you call your training aid a "Practice Beacon" on the radio, people who monitor are much less likely to get excited. In the past, there have been responders to 'ELT missions' when the target was actually a practice beacon. I'm sure I slipped somewhere in this site, though. The term "PELT" for "Practice ELT" may also be misleading. This acronym was used some time ago for "personal" ELTs, also called PLBs (personal locator beacons) or PETs (Personal Emergency Transmitters). ©1998 - 2007 Scott E. Lanis. All Rights Reserved.